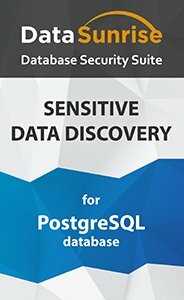 DataSunrise Data Discovery for PostgreSQL enables searching through a database to quickly identify tables containing sensitive data and establish their protection. The tool includes built-in search filters for various data types including personal, financial and medical records. Users are enabled to create their own filters as well. When it comes to data security the first logical step would be to identify the data that needs to be protected. What types of information a company processes and where is it located? Who has access to it? Are the controls strong enough to keep sensitive data secure? These are the questions to be asked when creating a successful database security strategy. It all starts with searching for sensitive information across the company's databases. PII, financial records, health and insurance data, and any information that can facilitate identity theft or potentially put the business at risk in case it is revealed to unauthorized users. Users can also create and edit their own search filters. The search of sensitive information can be performed across all available database elements or in a particular database or table. After specifying the location and data types to be searched DataSunrise identifies the columns containing the sought-for information, and then data masking, audit and security rules are created. Rules allow the database administrator to limit data exposure and set the appropriate level of protection. DataSunrise Data Discovery for PostgreSQL allows organizations to achieve complete visibility into the data they process and meet the compliance requirements of HIPAA, PCI-DSS, SOX, GDPR, etc.